Abdul Haq Shafiq, Son of Mohib Ali, was born in 1961 in Charbagh village of Sar-i-Pul provincial capital. He completed his primary education in Sar-i-Pul and then went to Imam Abu Hanifa High School in Kabul for secondary education. He received his BA degree in Islamic Education from one of the neighboring countries. During Jihad period in 1981, he was one of the Wahdat-i-Islami Party’s founders and served as military, political and culturalcommittees’ member and spokesperson for the party. During the Taliban regime, he was member of resistance front in Balkh. After collapse of Taliban, he participated in first Germany Bonn conference and Emergency Loya Jirga in Kabul and worked as secretary in Afghan Constitution Approval Commission. 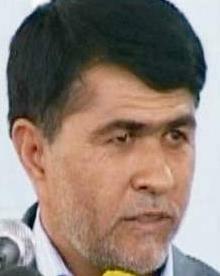 Since 2004, he served as governor of Samangan for three and a half year and then served as Faryab governor till 2011. Since 2013, he serves as governor of Daikundi. Shafaq is a Sar-e-Pol native, a Hazara and a former commander of Hezb-i-Wahdat party. He participated in the UN Talks on Afghanistan ( Bonn 1 conference in Germany) in November 2001 as an Adviser to the Cyprus Group Delegation. 12th grade graduates from Northern provinces competed for the fellowships in Balkh University on March 16th, 2006, but no one from Samangan province passed the exam. Allegedly he arranged, that no one else from Balkh University passed the scholarship exams. Due to pressure from Dostum, he stepped down as a Governor from Sar-e Pul province in june 2004. As a Sar-e-Pol native and a Hazara, he seems somewhat insulated from some of the ethnic rivalries (especially between the predominant Uzbeks and the Pashtuns). To all appearances, President Karzai is his principal power base. Faryab-based UNAMA interlocutors characterize him as a balancer of interests, as being above the fray, and say that local residents seem to appreciate his role. President Karzai during a special ceremony on 20120731 at the presidential palace, awarded Abdul Haq Shafaq the Mir Masjedi Khan medal. He is married and has children. One son is Mujtaba Shafiq. Shafaq speaks Dari and English.